Most people do not know about the precession of the axis earth, which causes precession of the equinoxes. The Earth rotates once a day about its axis of rotation; this axis itself rotates slowly, completing a rotation in approximately 26,000 years. The precession of the Earth's axis has a number of observable effects. See the second effect below on the seasons as it affects the summer and winter solstices. Winter solstice is when the north pole is farthest away from the sun, therefore it's winter in the northern hemisphere. Summer solstice is when the north pole is pointing towards and closest to the sun. 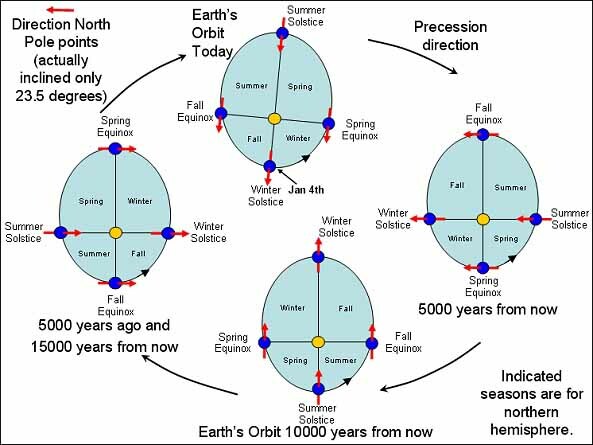 The second effect of precession is, the position of the Earth in its orbit around the Sun at the solstices, equinoxes, or other time defined relative to the seasons, slowly changes as seen in the diagram above. The winter solstice happens on Dec 21st, but at the axis of the earth changes, in 5000 years the winter solstice will earlier in the orbit. Every 1800 years the winter solstice happens about a calendar month earlier. Every year the winter solstice happens about 20 minutes earlier. Our Western calendar is the tropical calendar, so it is 20 minutes shorter every year than the time it takes for a full orbit of the earth around the sun. The tropical calendar takes precession into account. The tropical calendar is based on the seasons. Therefore the winter solstice is always on Dec 21st. However; the sidereal year is based on the full orbit of the earth around the sun with respect to the fixed backdrop of stars. The sidereal year is 20 minutes longer than the tropical calendar every year which keeps adding up, so the difference between the 2 calendars keeps growing. This becomes equivalent to one year per 25,772 years, so after one full cycle of 25,772 years the positions of the seasons relative to the orbit are "back where they started". The Western tropical calendar does not complete a full orbit around the sun, it is in fact 20 mins shorter than the time it takes for a full orbit around the sun. Since each year it's shorter the Earth is shifting backward on the circle of the orbit by 20 mins each year for the same date on the calendar. As the Earth is at a different point in the orbit each year, the zodiac the Sun is in, as viewed from the Earth, also slowly changes over the years. As mentioned above every 1800 years the Earth has moved back in the orbit about 1 month. The Western zodiac, sun signs, are based on the tropical year and are not aligned with the constellations in the background! So for example in Western astrology Libra starts on Sep 22, however; when viewed from the earth the Sun will be in the Virgo constellation, not Libra! In the Jyotish or Vedic astrology however; the measurements, sun signs, still correspond with the sun's background of constellations. So let me repeat, the fixed dates of the sun signs in Western astrology do NOT correspond with the astronomical or constellation the sun is actually in! The sun signs dates slowly shift over the years. For example this year Libra starts on Oct 17, Scorpio on Nov 16, however; over the years Libra will start later and later. Many hundred years ago Libra did start on Sep 22. Jyotish/Vedic astrology uses the equatorial plane. When the axis precesses from one orientation to another, the equatorial plane of the Earth moves. The celestial equator is just the Earth's equator projected onto the celestial sphere, so it moves as the Earth's equatorial plane moves, and the intersection with the ecliptic moves with it. The orientation of the Earth against the fixed stars changes because the axis of the earth is rotating. So right now Spring equinox is Aquarius. The sun will enter Aquarius on Feb 13th this year. Therefore the sun signs' dates are changing and are calculated in the Vedic astrology each year, the dates are not fixed as current Western astrology. Pandit Vamdev Shastry told me astrologically the winter solstice (inauspicious) is aligning with the center of the galaxy (which has a black hole) and which is in the Dhanus rasi (inauspicious) which means that time for settling of Karm has come and Dharm is at the lowest. When the alignment is/will happen is not exactly known. Mayans predicted it to be on Dec 21, 2012. At the same time the spring equinox is moving into the Kumbh Aquarius rasi. "The Aquarius symbol is metaphoric in content - meaning 'closure in water'. Water represents the collective unconsciousness or consciousness hologram which creates the grid programs of our physical reality. Many connect the Age of Aquarius with the return of the goddess, priestess, or feminine energies - those that vibrate above/faster than physical frequency. This is the return to higher consciousness, the awakening of higher mind and thought in the alchemy of time." So both the time of repayment of Karms, personal and humanity as a whole, as well as the global spiritual evolution to the next stage is happening at the same time.